Welcome to Episode #41 of the Living Homegrown Podcast! Note: All flower images within this post are courtesy of Debra Prinzing and SlowFlowers.com. It wasn’t until I became more intentional with my food choices that I even considered how I sourced other things in my daily life…like flowers. But a few years ago, I dug a little deeper and well…I was a bit shocked. Surprisingly, there are issues with the way many of our flowers are sourced here in the United States. Some practices are similar (and just as unsettling) as industrialized food. And the ramifications to our environment can be just as devastating. I know you are like me and you care about where your food comes from. We are “two-peas-in-a-pod” that way. So, I thought this topic would hit home with you as it did for me. Plus…Valentine’s Day is just around the corner, right? This is the perfect time to think about this. 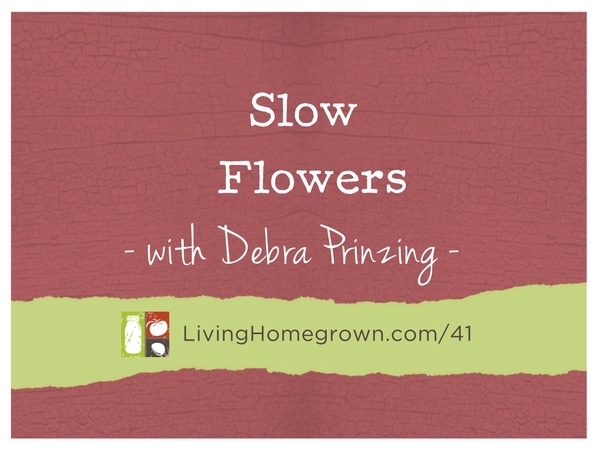 To shed some light on this topic for you, I brought in my friend Debra Prinzing of Slow Flowers. If you don’t have time to listen to this podcast episode, I have summarized the interview for you here with tips below for picking flowers this Valentine’s Day. Plus there are oodles of great links for you. But I encourage you to listen to get the full picture. Debra explains how we can make a difference in the environment by being more intentional with our flower choices. And she says that we reap benefits in our personal lives as well – because playing with flowers is very therapeutic! Back in 2008, Amy Stewart, wrote a fascinating book called, The Flower Confidential: The Good, The Bad and The Beautiful. The book shined an unflattering light on how profitable (and unsustainable) the flower industry can be. Boy…was it ever an eye-opener for me. And it was an eye-opener for my guest, Debra Prinzing too. Being a journalist meant that Debra started investigating. And she started seeking out and interviewing flower farmers here in the US who were doing things in a more responsible way. She soon found herself on a journey to not only educate people about the state of our flower market but to also share stories of the many incredible, hard-working flower farmers who are doing it right. And those farmers (who are scattered all over the United States) are growing flowers organically and sustainably. But they are also producing some of the most incredible plant material that is of a higher quality than we are used to from the industrialized flower market. You see, up until a few years ago about 80% of the flowers being sold within the United States were imported. And as those flowers come into the US, the only thing they are being inspected for is pests. Yep, the plant material we have been buying is dipped, sprayed and fumigated with all sorts of chemicals just so it can pass inspection. Not only that, but the fuel consumed to fly, ship and truck those flowers to their destination is ridiculous. And in many cases the workers in the fields that produced those flowers are not protected by fair labor laws – one of the many reasons the flowers are so inexpensive. However, due to the shift in thinking within the food movement to more sustainable FOOD practices and more support for locally sourced FOOD – A shift is also starting to happen within the FLOWER industry. And Debra is one of the hard working people to spread the word about the virtues of buying locally sourced flowers and supporting our flower farmers. 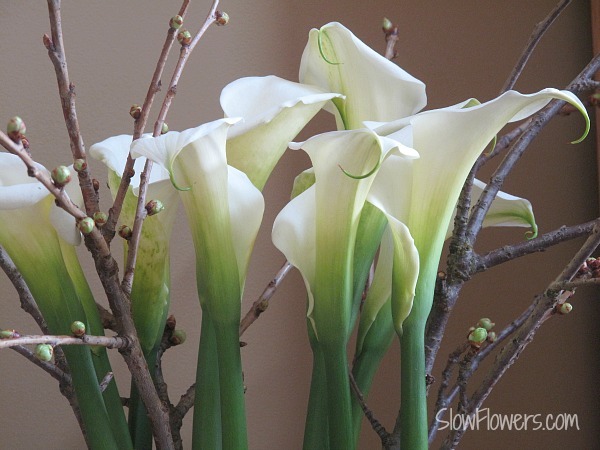 She coined the phrase “Slow Flowers” several years ago to explain this trend and this movement. Debra has written many fantastic books (I love them all!). But her two latest books pertain to this flower movement. The first book, The 50 Mile Bouquet: Seasonal, Local and Sustainable Flowers was written with the top-notch photographer, David E. Perry. And our mutual friend Amy Stewart (Flower Confidential) wrote the forward. The book was destined for success! In the gorgeous 50 Mile Bouquet, Debra and David shine a light on the farmers who are doing it right. It tells the story of the dramatic transformation in the flower movement in recent years and how we can continue the transformation today. Well, the answer is –Yes, if you think creatively! The pages are filled with inspiring ideas for picking a bouquet from your own backyard and beyond with tips for bringing flowers into your home – even in the dead of winter. It turns out that we really do have a lot of power. We just need to vote for what we want (more sustainable flowers) with our dollars. So we need to skip the imported, non-organic flowers and think more local/sustainable whenever possible. Give a bouquet from your own backyard. Even in the dead of winter, you’d be amazed at how beautiful twigs, evergreens and even bare fruit tree branches can be. Ask for locally sourced from your local florist. They should know what is in season and where they can buy locally. If not, go to another florist! Ask for locally sourced flowers from your supermarket. Only when we ask and make our wishes known will larger stores start to make changes in how they stock their stores. Give small potted houseplants instead of flowers. They last longer than cut flowers too. Give orchids instead of roses. Orchids do not ship well, so they are usually more local than the long stem red roses you see sitting next to them. Give bulbs like amaryllis or paper whites. These also last longer than cut flowers. They are fun to watch grow and when they bloom they are so beautiful. Give a gift card from a local nursery that can be used later in the springtime to buy local flowers and plants when there are more choices. 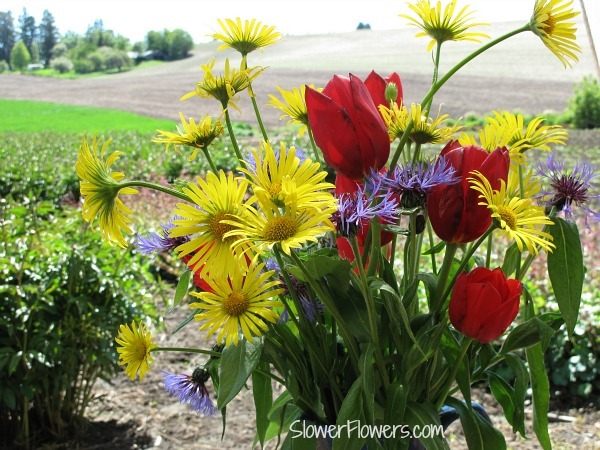 If you have your heart set on cut flowers and there are NO local flowers in your area, then visit SlowFlowers.com and American Grown Flowers for responsible sources that ship. Although it’s true that you have a larger carbon footprint, you can still purchase flowers that were grown in a responsible and sustainable way. And as you think about what to get your sweetheart this Valentine’s Day….think outside the box. Think local. And support your local grower if you can. Special thanks to Debra Prinzing and Slow Flowers.com for the use of her flower images. I never really thought about flowers this way before, but it makes sense. I usually compost everything grown in soil, but I may have to think twice about flowers unless they are sustainably (is there such a thing as organically grown flowers?) grown. I may have unknowingly added pesticide contaminated flowers to my compost without even thinking. I already found a local flower source about 30 miles away which I plan to visit when in the area. Great podcast Theresa. There ARE organically grown flowers! Debra writes about farmers doing that on her blog (see links above). Also visit SlowFlowers.com for more info for organic sources. You can contact Debra directly there to ask more. As for the flowers you composted already, I am sure it was a minor amount compared to the overall amount of compost you made. Would probably not even be traceable. But if you did it all the time, I would suspect that would add up. So yes, something for us to consider for sure. Thank you for highlighting this important issue. I stopped buying imported roses nearly two decades ago, after reading articles in my local newspaper about the devastating illnesses workers in Central and South America developed from unprotected pesticide and fertilizer use on rose farms. Environmental conditions in worker’s jobs caused horrific cancers and respiratory illnesses that ultimately killed the breadwinners. When they grew too sick to work, they lost their jobs and their income. The companies employing them did not pay for their health care, nor did they in any way compensate the families. Since then, I buy only flowers with the Fair Trade symbol or the USDA Organic label. Otherwise, I would have to live with the horror that my floral gifts to loved ones might cause the death of the workers who grew them.